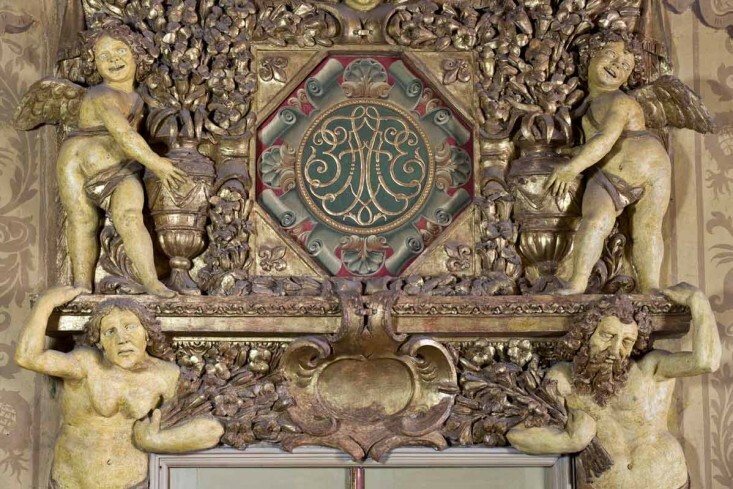 Isidoro Bianchi and his assistants decorated this room, starting at the large central panel which, in the late eighteenth century, was described as being filled with a large painting of ‘natural subjects’, but without specifying the subject. In later centuries other artists also worked in this room and now all that is left of this masterpiece is just a simple painting in blue which was probably done in the later nineteenth century. 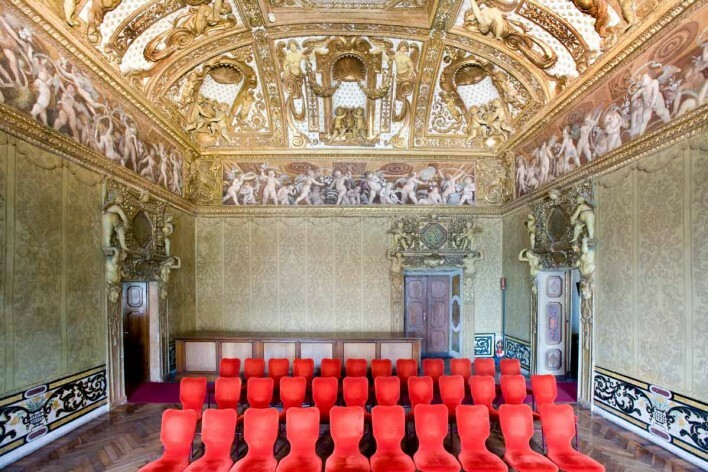 Domenico Ferri carried out extensive restoration work throughout the inside of the Valentino around this time and a lot of his work is still evident in this room. 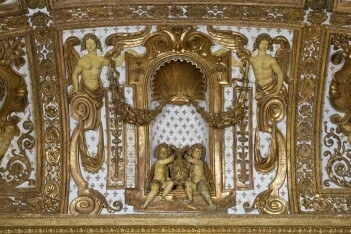 In fact, possibly the large stucco frieze which connected this central painting to the walls has preserved only the articulation of the vault in its original form with triangular coves at corners and rectangular coves above the walls. This ceiling design faithfully follow the general lines of the original model documented in the sketches drawn by Leonardo Marini after he was nominated in 1775 by Vittorio Amedeo II as architect and decorator of the Regi Palazzi (The Royal Palaces). 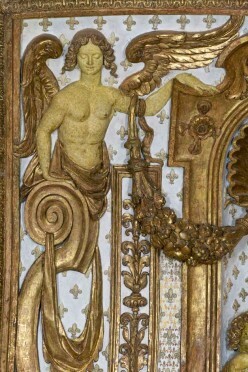 The sketch where Marini illustrates a part of this decorative border shows the subtle elegance of a female figure used as a column (or caryatid) connected by floral decorations to the simple architectonic frame of the adjacent niche wich houses two putti holding an amphora (a two-handled jar used by Romans and Greeks). The subtle decor created by the scrolls, candelabras and the caryatid’s garlands reminds one of the decor in the ‘golden flowers cabinet’. 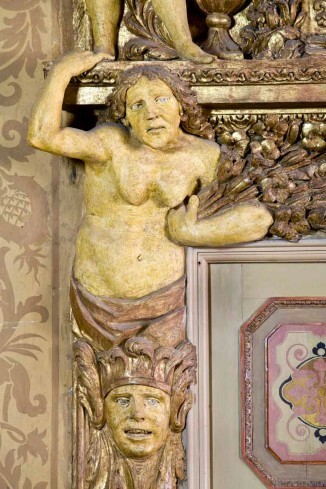 The style left today however, shows the room as having been heavily influenced by the Green Room – to the extent that it was probably the object of deliberate and simultaneous restoration projects. Even the obsessive and insistent use of the Fleur-de-lis appears to be part of an eighteenth century ‘horror vacui’ (a fear of emptiness) criteria to disguise these major changes in the placing of amphoras and statuettes. Marini clearly documents a white ‘face’ whose details are ‘picked out in gold’. This same sequence of colours reappears, this time inverted, on the tapestry which the 1644 inventory describes as “a floral and colourful leather tapestry with gold background, made in Flanders”. 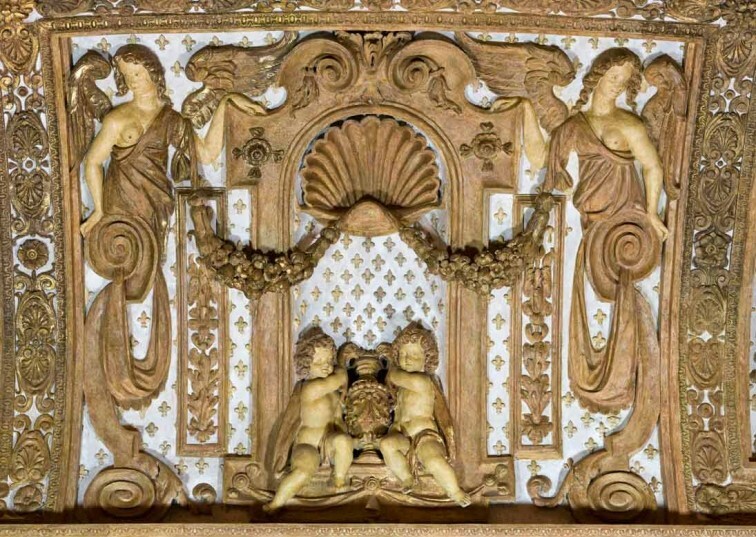 Another original feature appears to be the border between the walls and the ceiling, where, within thin stucco frames, Isidoro Bianchi had painted an uninterrupted line of putti playing with ribbons inscribed with Italian and French verses and twisting them around Fleur-de-lis. 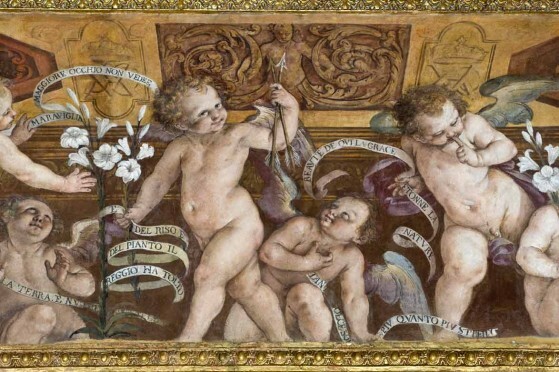 The dance of the putti, represented by figures in the foreground, actually take place in the background. This is an interior single space well definied by cove ceiling in perspective decorated with scrolls and royal monograms quite similar to those in the room entitled ‘Where Flowers are Born’. 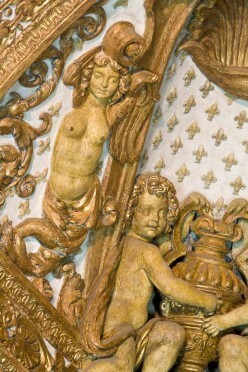 In the Fleur-de-lis room the corners of the painted freize are enhanced by the presence of two acanthus-limbed putti in golden stucco and flanked by lion heads. 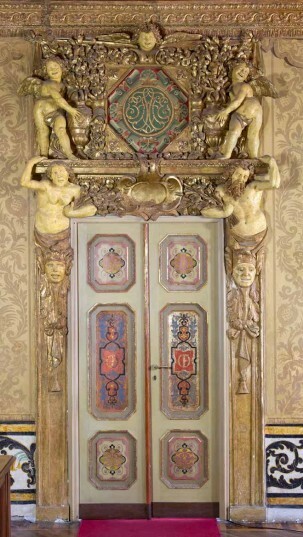 Energetic restorations seem to characterise the nineteenth century – even in fact, to the painting and sculpture over the doors and frames orginally done by Alessandro Casella in 1646. Particolari degli stucchi. 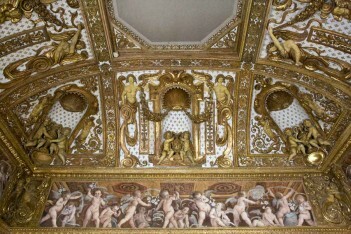 Il restauro conclusosi nel 2000, ha restituito il colore e la luminosità otriginaria alla decorazione, che vede il motivo araldico del giglio di Francia, simbolo delle origi di Cristina, ripreso insistentemente negli stucchi e nelle pitture. Le figure si muovono sullo sfondo di soffitti a lacunari in prospettiva, decorati a girali e monogrammi. Particolare degli affreschi del fregio. Particolare di una delle porte,.